Firstly I would like to thank Feliks Audio for this loan unit for review. Topping D30 > Espressivo MKII > German Maestro GMP400 / Wood Grado SR60e / Hifiman RE2000 / Ether Flow / HD650 / HD800. 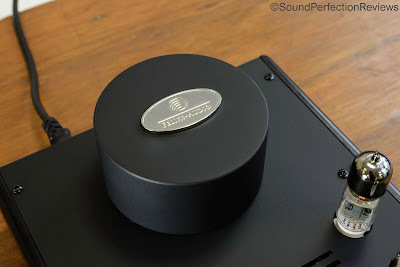 Feliks Audio have slightly revised their packaging, there is an outer shipping box, and another inner box which has stiff foam inserts that hold the amp in place. The tubes are packaged in their tube boxes, in a special cut-out on the top part of foam before you get to the amp below. The packaging is very sturdy and provides very good protection to the amp during shipping, the outer box is not a fancy retail box, but the packaging does feel very good and is definitely up to the job of keeping the amp safe. The Espressivo MKII much like the original is superbly built, being hand made in Poland you can see the passion that goes into making these amps. Everything is perfectly put together, the wood panels on the side are perfectly cut, the finish is now matte black and not as much of a fingerprint magnet. The design is the same externally, with 3 sets of RCA inputs on the back and a set of RCA outputs for use as a pre-amp, on the front you have the 6.3mm headphone output, the large aluminium volume knob and the input selector knob. The tube sockets are upgraded over the original Espressivo, and they feel a little tighter and more secure when installing the tubes. Overall the amp is perfectly put together, and from 2 years of no hassle ownership of the original Espressivo (still going strong), I expect the MKII will last equally as well. 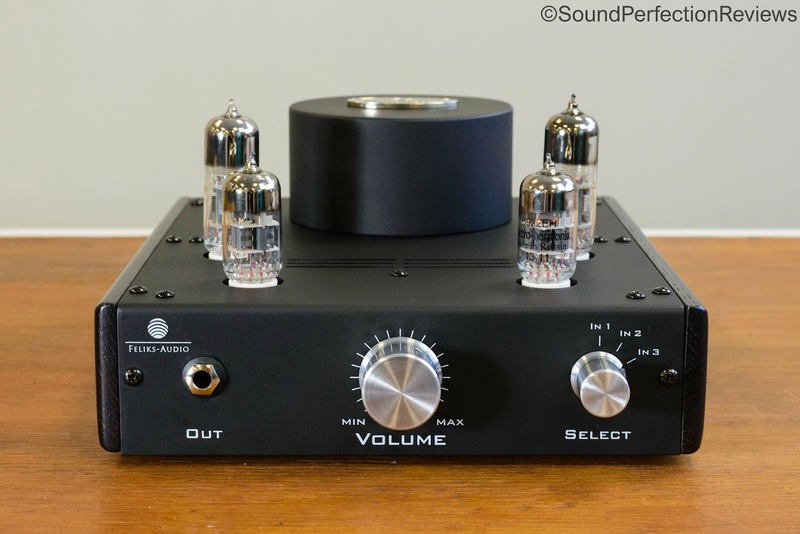 Be warned that like all tube amps, this one heats up substantially during use, it would be easy to burn yourself on the power tubes, but I have had no issues with leaving these amps on for periods of 8 hours or more. Accessory wise the amp comes with a power cable, that is all, and that is all that is needed in my opinion, you also get a manual and warranty card. One of the upgrades of the Espressivo MKII is the optimisation of the circuit to work best with 6922 driver tubes, this to me is excellent and 6922 tubes are readily available with plenty of NOS flavours out there. The power tube are 6N6P type, also easy to find on eBay with NOS gold grid 6N6P-I versions being very cheap. This means it is cheap and easy to replace any worn out tubes in the future, but from my experience the tubes last a long time in this amp anyway. It comes stock with Electro Harmonix tubes, which are not NOS, they sound great in this amp and add the tube warmth that makes this amp a pleasure to use with slightly more neutral/thin headphones like the GMP400 / HD800. I changed the tubes out to NOS 6N6P-I gold grids and Tesla gold pin 6922 tubes to see what difference it would make, and it really changed the character of the amp. Now vocals took centre stage, the bass became tighter and there was a little more air and detail up top, this worked wonders with slightly thicker headphones like the HD650. The Espressivo MKII can be tuned with tubes to the sound you want out of it which is great. 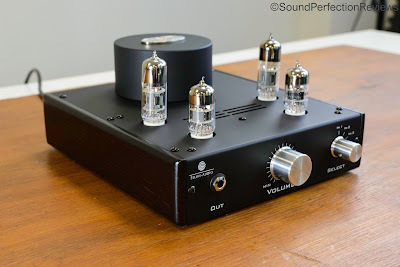 For my main headphones, the GMP400, the stock 6922 tubes with the NOS 6N6P-I gold grids was an excellent pairing. Well the Espressivo MKII is really made for high impedance full-size headphones, using them with lower impedance headphones like the Grados works fine but the sound is not as tight and controlled as when used with a solid state amp with lower output impedance. This amp did however work well with the Hifiman RE2000, I did have to lower the DAC output a little though due to the high gain of this amp. I do however think that anyone buying this amp knows that most OTL amps are not designed for use with sensitive, low impedance headphones. This amp is also not designed to be used with the hardest to driver planars like the HE-6, as the volume starts to clip when pushed hard, but again this is not what this amp was designed for. It does do a fair job at driving more sensitive planars like the HE500 and Ether Flow, but I do still prefer their synergy with a high powered solid state amp. Now when paired with the right headphones (HD800 / GMP400 / HD650 etc....) this amp just oozes sound effortlessly, the quality of sound that comes out of this amp is superb. It is not a slow sounding amp, but it is not harsh in the slightest, just like the original Espressivo it produces a very clean and punchy sound but with a little added warmth to it. The MKII is a little smoother than the original, which with the stock tubes, did not sound like your typical OTL amp. And you can make the MKII sound like that with certain tube combinations, but this review is of the amp in stock form. The MKII is a full sounding amp, but devoid of any bloat that is often wrongly associated with tube amps. 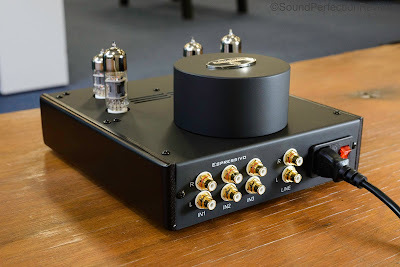 The Espressivo MKII is devoid of any veil, it is a detailed amp but the details are not forced upon you in an analytical manner, instead they are there for you to pick up on should you want to. The lows are full bodied with excellent articulation and also layering, they come out of a deep background giving the sound real depth and body but without sounding overbearing or boosted. This is where is amp injects most of its magic, bringing out the soul and body in slightly colder sounding headphones. The midrange is devoid of colouration from the lows, it is crisp and open with a very natural tone to it, you never miss out on any detail in the recording. The highs are well presented with effortless air and extension, but they are ever so slightly smoother than some of the more neutral solid state amps. The highs are all there, it is just they are not as sharp which helps again smooth out any slightly harsher headphones. Yes this is a slightly fuller, smoother sounding amp, but compared to the many cheaper tube/tube hybrid amps, the Espressivo MKII has much better layering, detail and soundstage. It is not a muffled sounding amp; it has a subtle warmth to it, that you just want to keep listening to. It pairs so well with many higher impedance dynamic headphones, the Beyerdynamic Amiron Home, DT880 600 Ohm and the T1 2nd Generation all sound incredible out of the Espressivo MKII. 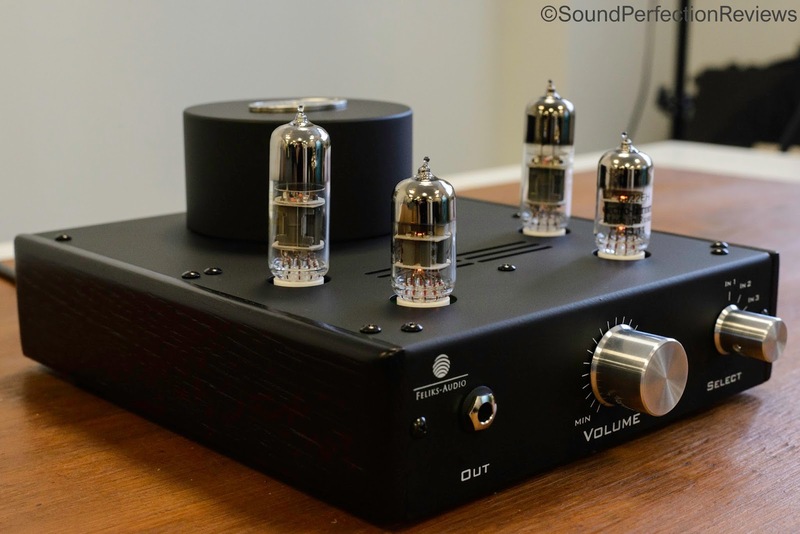 As said before the sound can be tuned with different tubes, but in its stock form it sounds wonderfully smooth, articulate, dynamic, detailed and open. When I saw the price increase from the original Espressivo, I was worried the MKII would be very similar and thus not as good value for money as the original was. Since getting the MKII my thoughts have changed, the MKII is indeed a real upgrade and not just a subtle side step with a higher price slapped on it. It may look the same on the outside, but they have really tweaked the internal design and it now works better with lower impedance headphones (my SR60e sound better out of the MKII than the original) and also made it so 6922 tubes work best. The Espressivo MKII is slightly fuller, better layered and overall a step closer in sound to the Elise. It just wants you to enjoy the music, it wants you to listen until the early hours of the morning, it does not try to fatigue you with any emphasis on any particular part of the frequency response. I could go on and on about this amp, but to me what sums it up is my willingness to just listen out of it for hours on end, with nothing but pure joy. So is it worth the money? Well at €799 it is not cheap, but it is an investment, and also a work of art. It is expertly hand crafted, and built to bring you years of service. So if you have some higher impedance full size headphones that you will be holding on to for a few years, then the Espressivo MKII should be on your list of amps to pair with them.